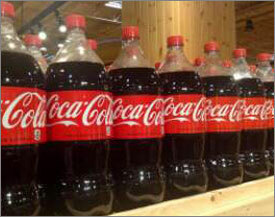 Coca-Cola, the world largest producer of non-alcoholic beverages since 1949, has dedicated a new US$5.7 million plastic bottling production line at its existing factory in Monrovia. "The newly dedicated plant has the capacity to produce 6,000 plastic bottles per hour," General Manager Seth Adu-Baah said. The company is contemplating producing juices of various kinds in addition to soft drink products that include Fanta, Sprite, Coca-Cola, Tonic Water, among others. It will also produce safe drinking water, he said. The investment will not only reduce dependency on imported materials for production, but also enhance employment opportunities for Liberians as the company will now have the capacity to supply the Guinea and Sierra Leone markets, Adu-Baah stated. An estimated 7,500 direct and indirect employment opportunities will be created over the next five years across Coca-Cola's supply-chain of distributors, retailers and material suppliers. "Liberia may have been fractured by the tragedy of Ebola over the last year but its spirit of optimism, ambition and progress will never be broken," said Alex Cummings, Executive Vice President. At the dedication ceremony on October 26, the Chairman of the Equatorial Coca-Cola Bottling Company, Alfonso Libano, said, "By creating new direct opportunities within our bottling plant, we hope to transform the opportunities available for current and future generations while providing more beverage choice than before to consumers." Coca-Cola Liberia has distributing trucks that supply consumers in accessible cities. In remarks, Montserrado District #5 Representative, Henry Fahnbulleh expressed satisfaction over the expansion and extended appreciation to the Coca-Cola Bottling Company for providing job opportunities and meeting consumers' needs. Commerce & Industry Minister Axel Addy also lauded the Coca-Cola Bottling Company for demonstrating, "excellence in serving the Liberian people." Minister Addy, however, emphasized that Liberia will shortly become a member of the World Trade Organization (WTO), and that the business community should begin to brand their products to standard in order to compete with other countries. He expressed the need for bigger companies to prioritize Small and Medium Enterprises (SME) as they constitute 96% of businesses in the Liberian economy.